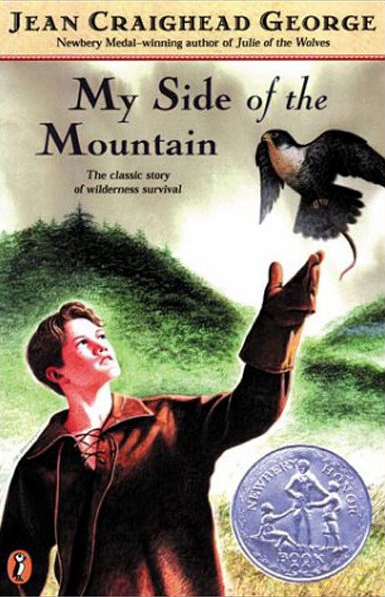 I first read My Side of the Mountain by Jean Craighead George in grade school (sometime in the '80s) and was immediately in love with the idea of running away to the woods to fend for myself. I attempted to teach myself to whittle using a teeny Swiss Army knife and have a scar on my finger to this day. I romanticized camping and had two of the best weeks of my childhood at a camp that taught me how to shoot a bow and arrow, riflery, and rock climbing. For years, I consumed all books on surviving and disaster preparedness. I even joined a civilian search and rescue team. Fast forward to my recent re-reading of this book... I was braced to find that it did not weather the years well, or that it didn’t live up to my memory. I thought that I would be skeptical of Sam’s independence at such a young age. Fortunately, I’m happy to share that I found it more believable than I remembered, and I still loved it. I was not as horrified at the ancient 1959 text as I had been prepared to be. I can see my nephew, who is close to the age Sam is in the book, being able to accomplish many of the same skills – fishing, starting a fire, living outdoors. I’m not so sure about chewing deer hide to soften it, but I’ll give that one a pass. One part I didn’t really remember was how prominent libraries are in the book. Sam learns most of what he needs to know at the New York Public Library and the local library near his mountain. The librarian doesn’t bat an eye at young Sam and helps him with his research, keeping to our librarian ideals of privacy by not revealing him to the world and focusing on finding the information he needs (plant identification books), not just what he asks for (the location of his family farm). This warmed my little librarian heart, let me tell you. Of course, reading this as a mother now, I was terrified with every stranger meeting in the woods. "An outlaw!" I said to myself. "Wow!" …. "You are a murderer or a thief or a racketeer; and you are hiding out." Nope. That does not sound like something that would end as well today, or maybe I just watch too much Criminal Minds. All in all, the book holds up surprisingly well. With the current trend with kids moving away from helicopter parents to wild, outdoor play, I could almost see this book set in modern times.